These tools for scribing rivets on plastic models are extremely easy to use and useful on all types of plastic model kits and craft projects in 1/72, 1/48, 1/32 and similar scales. There are six Single Wheel tools available with the following tooth (rivet) pitches: 1.00, 0.75, 0.65, 0.55, 0.50 and 0.40mm. 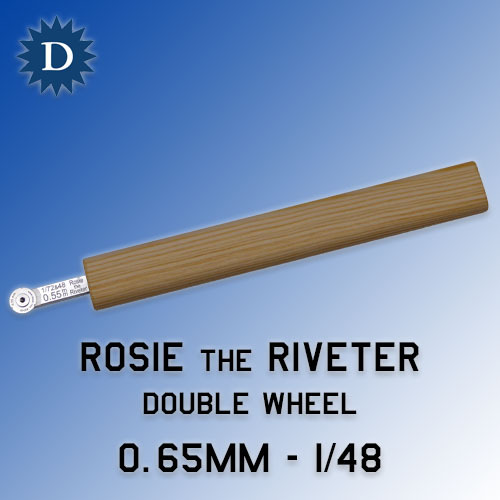 The same dimensions apply for the Double Wheel riveters, with spacing between rows of rivets approximately equal to the rivet pitch of the corresponding size. The two wheel design produces realistic parallel lines of rivets that are offset from one another. These pitches and the recommended scales overleaf reflect the fact that rivet pitch usually varies from 25 to 40mm on a real airplane. It means, for instance, pitch can vary from 0.52 to 0.83mm on 1/48 scale models - there are different rivet pitches on various areas on real aircraft. 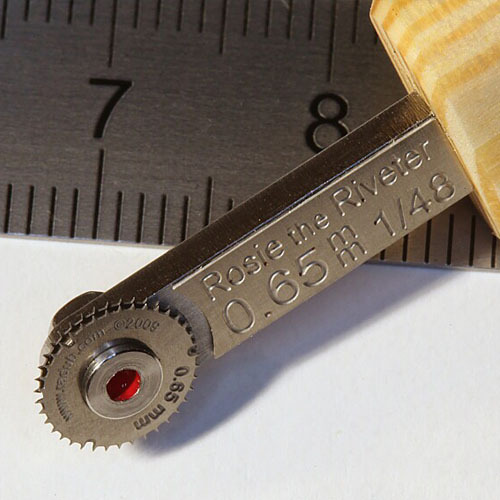 Please note the rivet head diameter varies from 3 to 6mm in reality which translates to 0.06mm to 0.13mm in 1/48 scale - therefore, the imprints of the tool should be very delicate on your model! Rosie tools are hand made from the finest components and materials. The 1.00, 0.75, 0.65 and 0.55mm pitch rivet wheels are photo-etched, custom made by RB productions. The 0.40 and 0.50mm wheels are made of tough stainless steel, single-purpose designed, and produced using special technology to achieve our strict requirements for tooth imprint. The wheels are seated using a precise spindle and fixed with minimal axial play to a stiff steel beam. The beam with the wheel is held in a lightweight wooden handle of oval cross-section, which gives you precise and oriented control with a comfortable hand grip. The tools can be used on plastic, resin and soft metal (aluminium, lead) parts, in conjunction with a ruler or freehand without a guide - for example, putting a rivet line between two points marked by a compass. It is necessary to exert a light, exclusively radial pressure on the wheel into the treated material, to generate rows of "rivets" by pulling or pushing the tool over the surface. Maintenance: drop some liquid lubricant between the wheel and spindle or between the wheel and beam at intervals. Don't push or drop the wheels against hard materials, such as glass or hard metal. The lighter is the pressure when using the tools, the higher will be their durability!